On Saturday, May 4, more than 5,000 animal lovers and 2,000 of their four-legged friends will gather together to take part in San Diego Humane Society’s Walk for Animals, an event that raises critical funding to give second chances to homeless, injured, orphaned and abused animals right here in San Diego. Don't miss this opportunity to enjoy some outdoor exercise with your pet and fellow animal lovers while supporting a great cause. Promo code SDVILLE gets $10 off registration! 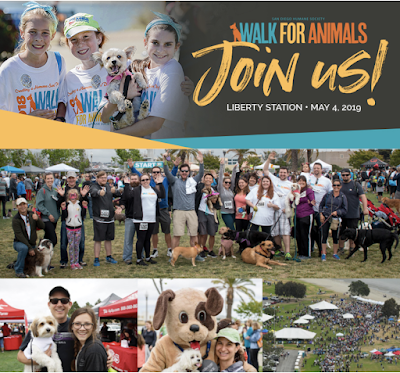 The Walk for Animals gives attendees the opportunity to celebrate their love for their pets, save the lives of homeless animals and help create a more humane San Diego. The morning festivities will include a delicious pancake breakfast, a scenic two-mile walk, fun-filled doggie activities, an Adoption Alley with adoptable animals and demonstrations by the Purina Pro Plan Performance Team. Watch the high-flying Purina Pro Plan Performance Team’s amazing flying disc routines! There will also be a Vendor Village with plenty of fun and useful resources for pet owners. Registration for the Walk for Animals is currently $30 for adults and $15 for children with prices increasing on the day of the event to $40 for adults and $20 for children. All participants will receive a commemorative Walk for Animals T-shirt and a ticket to the pancake breakfast. The event starts at 7am and takes place at NTC Park at Liberty Station, located at 2455 Cushing Road in Point Loma. Visit the Walk for Animals website to pre-register for the event or to make a charitable donation. Promo code SDVILLE saves $10 per registration. For more information about the Walk for Animals or to register, visit sdwalkforanimals.org.